We all know the names and unfortunately the associated smells. McDonalds, Wendy’s, KFC and Taco Bell are probably more recognizable to the general public than the President himself. The fast food industry has brilliantly woven itself into the very fabric of America. Greasy spoon items such as the Big Mac and Quarter Pounder have quite frankly supplanted the once proud Apple Pie as the culinary symbol for the red, white and blue. Marketing strategies formulated in executive boardrooms of franchisors, like McDonald’s, have targeted children, creating a youthful fan base of fast food addicts by using gimmicky toys that just also happen to be tossed into a sack full of high calorie, sodium and fat filled fare. McDonald’s own child-centric offering, the Happy Meal, has enjoyed remarkable staying power. The now infamous combo was introduced in 1979 and is still going strong. But unfortunately that longevity goes well beyond just remaining a force in the fast food industry—even though that is bad enough on its own. This brings us to New York photographer Sally Davies who purchased a McDonald’s Happy Meal back in April, set it on a glass plate and has been photographing the meal regularly. As of Day 145 the Happy Meal shows no signs of decay, mold or foul odor. This Dish Is Veg: What inspired you to start the McDonald’s Happy Meal Project? Sally Davies: My good friend, who owns a chain of burger restaurants here in NYC, and I got into an argument one day about fast food, particularly meat. He was quite sure after 3 days the meat would begin to mold if left out, with no refrigeration. I didn't agree. So I bought a McDonald's Happy Meal (closest fast food restaurant to where I live) and brought it home. 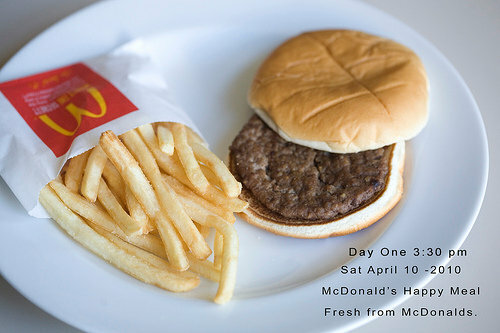 TDIV: How long will you continue to document the Happy Meal purchased on April 10, 2010? Davies: I'm not sure. Right now I am photographing it every 2 weeks approximately and it is still the same all the time. No changes. TDIV: In the past we featured a Happy Meal experiment that took place in Colorado. 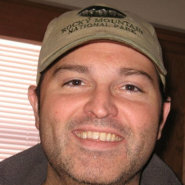 Many people attributed the preservation to the dry conditions of the state. You live in NY which we know to be a humid location, especially during the summer. Can you explain the conditions in which the Happy Meal is being kept? Is it out in the open? What is the average room temperature? Davies: The food is on a glass plate in my living room on a shelf. I take it down about every 2 weeks to photograph. No refrigeration and not covered with anything. It has been there with very humid temps and no air conditioning and also with the air conditioning on. TDIV: To date, is there any decay on the food? What about odor? 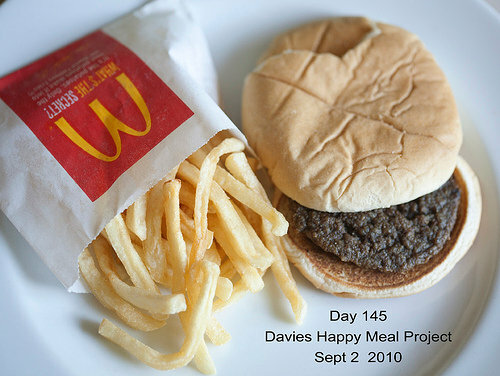 Davies: The famous McDonald's smell to the food was gone within 48 hours completely. After that, there was no smell at all. No food decay and no bugs. Not even my two dogs were interested in it. The burger turned to stone very fast, as well the fries. It's as if it was petrified wood or fossilized. Only the bun is dried out and part of it broke off. I think eventually the bun will turn to dust and disintegrate. The fries are still that yellow fresh color. The meat patty shrank a little bit as it dried out, but other than that, it looks the same. TDIV: Have you ever been contacted by McDonald's or any fast-food supporting groups? Davies: Not directly, but McDonalds did respond to the Toronto Star (who interviewed me for the project story). They wondered why it is always McDonald's that everyone picks on and suggested that my project had little merit because they had no idea what the experiment's conditions were. They also said most fast food would do the same thing. And to that end, I have to agree with them. I do not think this is a McDonald's issue, but rather a fat food/processed food issue. TDIV: What do you hope people learn from this experiment? Davies: I hoped to prove to myself, what I already suspected, which was that this is not natural food and it is highly chemicalized. I quit eating meat when I was 15, 39 years ago, but at that time, because of the animal cruelty issue. Only recently have I started to investigate the health benefits of a natural plant based diet.